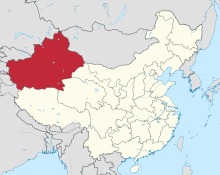 Xinjiang (also transliterated as Sinkiang) is a region of the People's Republic of China. Like all of China it is also claimed by the Republic of China. It is a large area with few people. It is over 1.6 million km2, which takes up about one sixth of the country's land. In the 19th century, when the name of the Silk Road was first used by a German geographer, it just included the land route from Xinjiang to Central Asia. Xinjiang sits at the heart of the Silk Road in China. At that time the country was often called "Chinese Turkestan" for its many Turkic peoples. Xinjiang borders the Tibet Autonomous Region and Jammu and Kashmir's Leh District to the south and Qinghai and Gansu provinces to the southeast, Mongolia to the east, Russia to the north, and Kazakhstan, Kyrgyzstan, Tajikistan, Afghanistan to the west, Pakistan, and Kashmir region to the southwest. Urumqi is the capital of Xinjiang and the largest city in western China. It also holds the world record for being the most remote city from any sea in the world; it is 2,500 km from any coastline. The east-west chain of the Tian Shan Mountains separate Dzungaria in the north from the Tarim Basin in the south. Dzungaria is dry steppe. The Tarim Basin is desert surrounded by oases. In the east is the Turpan Depression. The Taklamakan Desert is also in Xinjiang. Urumqi, the capital, Turpan, Kashgar, Karamay, Yining and Shihezi are the major cities. This page was last changed on 28 September 2018, at 10:42.